Just like people, puppies grow at different rates and just like children going through growth spurts they will often take time to adapt to their new size. 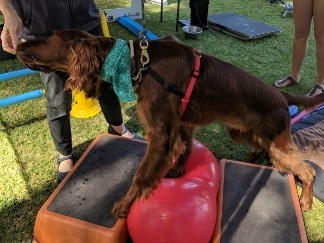 Whether your pup is a pre-school drop out or dux of the class there are some games you can play at home and out and about that will help to improve their stability and awareness of where their legs are. So how much exercise should we be giving them at what age? If your dog is under 1 year of age they should not be running, on or off lead for more than 5 minutes per month of life per day. Not many 7-year-old children would be happy to run in the park for more than 10 minutes non-stop every day. Any dog under 1 year old should have their exercise controlled. Dogs younger than 2 years of age should not repetitively chase a ball, Frisbee or stick as their joints are not yet fully formed. Whether your pup is a pre-school dropout or dux of the class there are some games you can play at home and out and about that will help to improve their stability and awareness of where their legs are. Spending 10-15 minutes training static or slow activity exercises is the equivalent to running in the park for an hour without the issues of injury or over exercise for developing joints. These exercises can improve strength and endurance, as well as improving balance and flexibility in your growing dog. Back-up exercise. Start this in a narrow space until your dog understands what is required. Standing and balancing, then progressing to doing this on slightly unstable surfaces. (1) Housing- and exercise-related risk factors associated with the development of hip dysplasia as determined by radiographic evaluation in a prospective cohort of Newfoundlands, Labrador Retrievers, Leonbergers, and Irish Wolfhounds in Norway. Krontveit RI, Nødtvedt A, Sævik BK, Ropstad E, Trangerud C.
Am J Vet Res. 2012 Jun;73(6):838-46. doi: 10.2460/ajvr.73.6.838. Cruciate Injury- No 1 on our top 5 orthopaedic conditions list. Does your Super Senior need a new sidekick?